The debacle of RGV’s recent film Department doesn’t seem to have affected the plans to release the film in Telugu.Even before the film was released, RGV had announced that the film will be dubbed in Telugu and it made sense because of the presence of Rana, Lakshmi Manchu, Madhu Shalini and few other actors who regularly star in Telugu films. 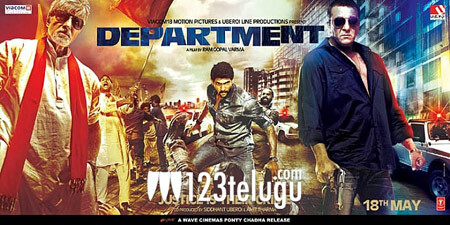 Now, RGV has revealed that the Telugu version will have some never before seen scenes and also added that the film will be named as Rendo Department. “Department asalu version ni tondharlo telugu lo `Rendo Departmet` perutho vidudhala cheyyabothunamu.idhi chala vere scenelatho vuntundhi,” RGV posted on Twitter. The film’s debacle sparked a battle between RGV and Sanjay Dutt with the former accusing that the actor is responsible for ruining the film. We’ll have to wait and see how the film does in Telugu.